A unique mixture of eclectic acoustic guitar songs, vocal songs (Japanese folk music and originals) and poetry with audience participation. 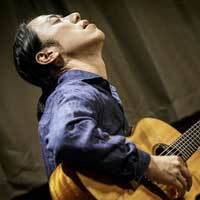 Hiroya is a one-of-a-kind composer, guitarist and singer-songwriter from Kyoto, Japan. He began playing the five-string banjo when he was thirteen, and took up the guitar shortly after. In 2000, Hiroya received a scholarship to Berklee College of Music and came to the United States. He formed his own group in Boston “INTEROCEANICO (inter-oceanic)” which consists of unique musicians from different continents including Latin Grammy Colombian singer Marta Gomez. The group released three acclaimed records (“The Other Side of the World“, “Confluencia” and “Where the River Shines“). Hiroya released two solo albums (“Heartland” and “Places“) from Japanese record label 333 discs.